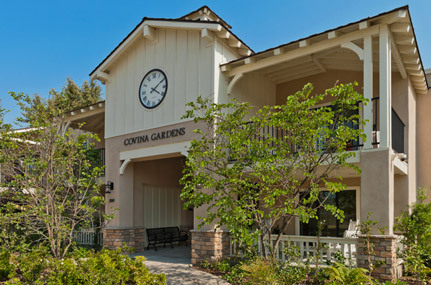 Covina Gardens is a recently renovated 90-unit affordable housing community located in Covina, CA for people 55 and over. The property is currently accepting applications for the waiting list. This property accepts Housing Choice (Section 8) and VASH vouchers. Each one bedroom unit includes wall-to-wall carpeting, heating and air-conditioning, a walk-in closet, and a kitchen with a stove, refrigerator, garbage disposal and pantry. The spacious community room features a large screen television, computers, a pool table, and fitness center. Resident activities include bingo games, monthly resident birthday celebrations, and off-site recreational and educational trips.